Be reduced to rubble by the ruthless Romans! Would you be shaken or stirred by Richard III? Mount a mutiny against King Henry VIII! See Mary Tudor knock the spots off Mary Queen of Scots! Will Queen Elizabeth I endure her terrible teeth? Would you be hanged by King James I for being a witch? Peep into the world of Samuel Pepys and help Georgian detectives find the headless man! Take a trip into the night with the night soil men and discover how to survive the first ever train ride! It's the history of Britain with the nasty bits left in! We all want to meet people from history. The trouble is everyone is dead! So it's time to prepare yourselves for Horrible Histories live on stage with a brand new West End show that has never toured before featuring all new scenes! Performers Ben Martin (Rex), Pip Chamberlin (Roger), Jamie Sheasby (Understudy). Author Neal Foster. Company Birmingham Stage Company. Director Neal Foster. Design Jackie Trousdale. Lighting Jason Taylor. Sound Nick Sagar. Music Matthew Scott. Choreographer Kenn Oldfield. Between 5th May 2019 and 31st August 2019 this tour will visit 9 venues in Cambridge, Cromer, Southport, Portsmouth, Crewe, Bridlington, Loughborough, Winchester and West End. Current and future dates only. This production has already been seen in 15 venues since 21st February 2019. You can embed this tour information on your own website by adding a single line of code to a page and using the Qtix code T282273889 - for details see our Embed Information page. 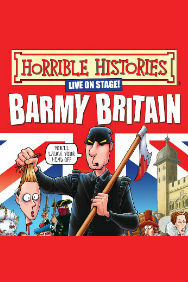 Receive email notifications of changes to Horrible Histories - Barmy Britain Part 4.